When proponents of healthy eating talk about the “Mediterranean diet,” they are talking about Italian food, but not Italian food as it is often consumed in the United States. Here you find huge servings of pasta, drenched in heavy sauces and overwhelmed with cheese. Not for the weight-conscious at all. In Italy, the Mediterranean diet uses lighter preparations and more vegetables and legumes than you’ll see on the typical Olive Garden menu. My Sicillian grandmother might pair a pasta with a light sauce made from nothing but garlic, olive oil and broccoli. Or peas with a touch of tomato and some of the cooking water from the pasta itself. One of my favorite restaurants in Rome serves nothing but fried fish and giant white beans cooked with onions in olive oil. A recent visit to il Giallo Osteria and Bar in Sandy Springs, Ga., allowed The Restaurant Dieter to order just such a meal from a nicely accommodating wait staff. In Weight Watcher terms, a very filling dinner was a mere 14 points. il Giallo is proudest of the pasta, which is made on-site. This point took a starring role in the server’s menu spiel, which unfortunately went to record length. Pasta can be ordered in a large or half portion for those who wish to have a “primi” in the spirit of a traditional Italian meal: antipasti, a small primi of pasta or risotto and a secundi of meat or fish. il Giallo’s menu has its share of rich pastas; this restaurant is in the suburbs of an American city, after all. But one seemed doable if only the butter could be left off. It certainly could, the sever immediately agreed. 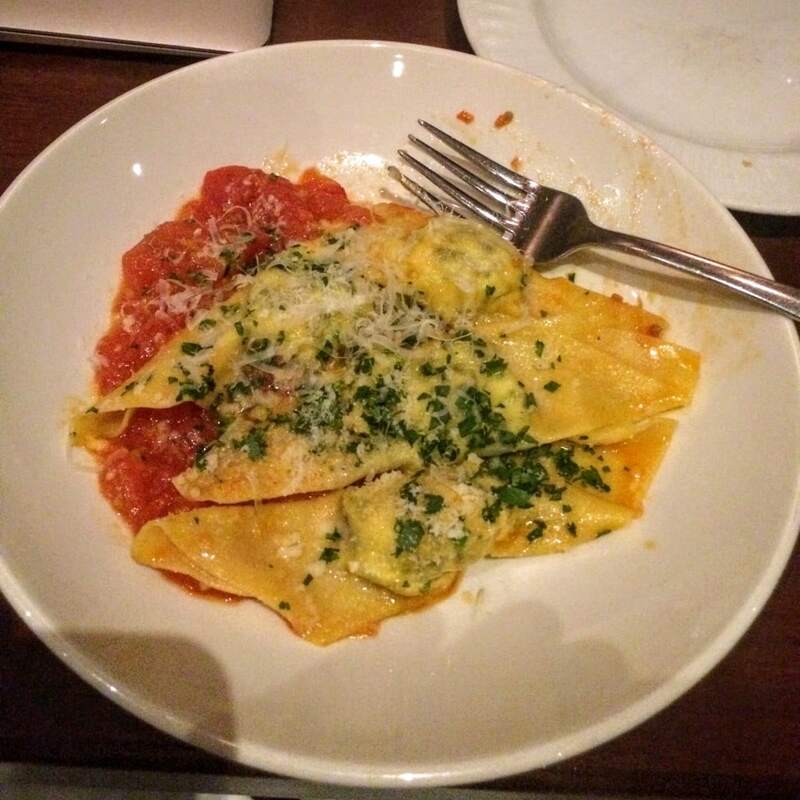 What arrived were three perfectly cooked tortelli, stuffed with a bit of cheese and an earthy tasting of greens and a modest amount of marinara on the side. It was excellent, and the butter was neither needed nor missed. When any restaurant menu has so many vegetable sides — cortoni, as they’re called in Italian — I often make a meal of two or three. There were seven on the il Giallo menu. The the server offered to make a plate of three. It was enormously filling — huge mounds of nicely caramelized cauliflower and golden beet with a bowl of simply prepared cannellini beans. The kitchen’s presentation on one plate deserves praise, too. 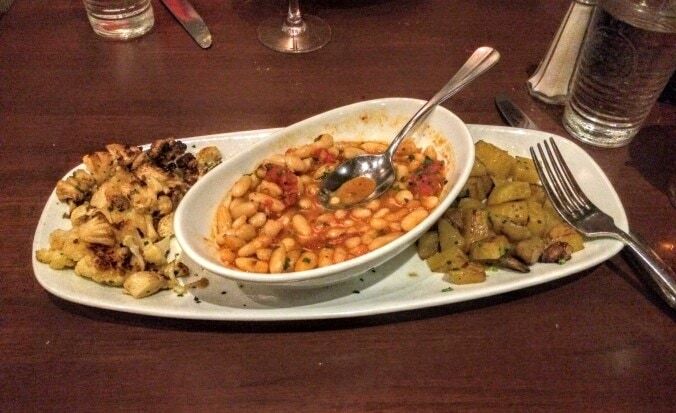 It’s embarrassing when a restaurant is so clueless that, even when asked for a vegetarian entree, sends out two or three plates and tries to wedge them onto the table. All were excellent, but I couldn’t finish. I assessed 7 Weight Watchers SmartPoints for a cup of the beans and another 4 for the fats in the preparation. And were it not for il Giallo’s location — a strip mall off Roswell Road — I felt I might just have been in Rome.